DrinkWire is Liquor.com’s showcase for the best articles, recipes and reviews from the web’s top writers and bloggers. In this post, The Gastronom offers a tiki cocktail. 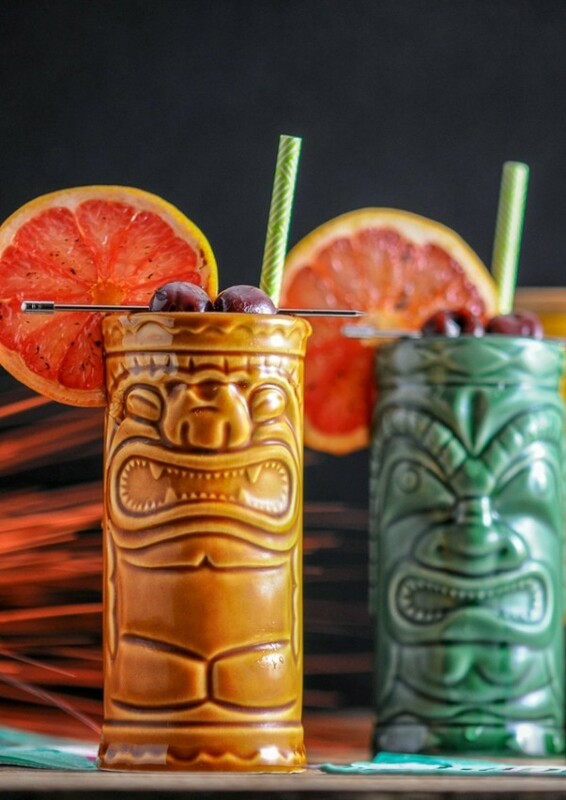 When you hear the word Tiki, you typically think of being served a sweet rum soaked cocktail full of fruit, but as more folks rediscover the world of Tiki, all kinds of drinks are being created using more than just rum! For the Rambler's Ruby we combine the herbal citrus of gin with the smokey bite of mezcal to create a delightful spiced sipper! Gin isn't your typical spirit you turn to when you think of paradise, but in reality it has long had a history of being found in tropical locales thanks to being required provisions on the ships of the Royal Navy as they headed out on their voyages to far flung corners of the world. Long thought of as part the cure for scurvy and malaria, Royal Navy sailors carried their gin to their port of calls and soon gin was the spirit to turn to in summery weather where it inevitably found its way into cocktails! We combined the gin with a nice Oaxacan mezcal, which adds a hint of campfire smoke and spice to the Rambler's Ruby. Mezcal and Gin is a fun flavor combination, as the hints of fruit, spice and smoke of the mezcal is brought out by the bright hints of citrus and botanicals from the gin. Add in a splash of Allspice dram to layer in a rich layer of warm baking spice and a slight hint of bitterness, and the combination of spirits makes for a flavor sure to tease your tongue! 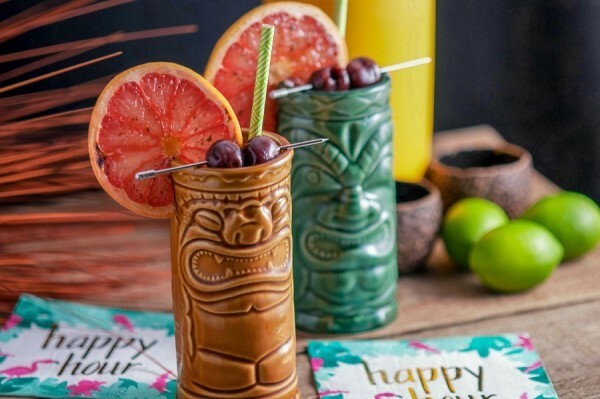 No Tiki drink is complete with out some fresh fruit juice, and for this we went with some fresh squeezed Ruby Red grapefruit and lime juices. The combination of sweet tart grapefruit and lime brings for a rich layered citrus flavor that plays well with the gin and mezcal. We need a little sweetness to bring everything into balance, so we add a little cinnamon syrup and orgeat. The rich warmth of the cinnamon syrup adds just the right amount of sweet and spice, while the toasted nutty sweetness of the orgeat adds a real mellow tropical note to the Rambler's Ruby. A few dashes of Angostura Bitters and a dash of Scrappy's Orleans Bitters rounds out the cocktail. Give our Rambler's Ruby a try and you might just forget all those memories of sweet rum tiki drinks! Cheers! Add all ingredents to a shaker with ice. Garnish with a brandied cherry and bruleed grapefruit wheel. We are Jay and Leah, a husband and wife blogging team from Omaha, Nebraska. We love to share our passion for all things craft cocktail, alcohol related food recipes and desserts and spirited travel!